at the Laguna Niguel, California Design Center. 1. 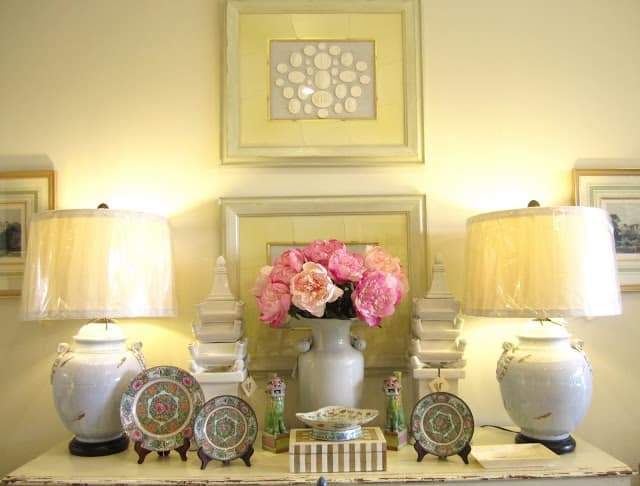 Notice the antique Chinese plates with pink and jade. These seem to be gaining a resurgence in popularity. 2. Blue and White China is still going strong. 3. 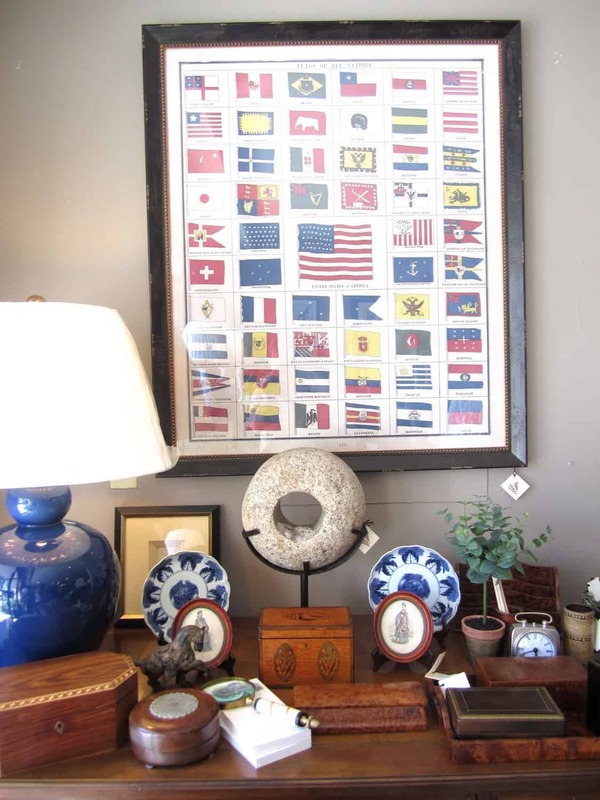 Framed Antique Maps are on trend. Look for authentic maps (that have meaning to you–like where you or your ancestors are from or places you love to visit) on ebay and have framed. 4. Use Vintage Textiles to have pillows created. The red fabric is new from Elizabeth Benefield’s designs. at Interior Design Musings here. 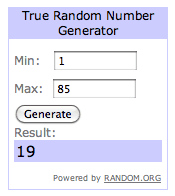 from Marianne won the Glass Pumpkin Scented Candle! Visit Marianne at Style for Living. I love her blog. Beautiful Pictures. I love her showroom! Beautiful images. 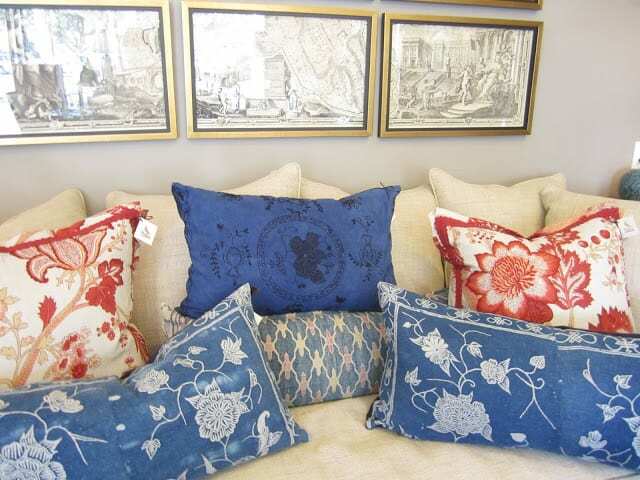 Love the fabrics on the pillows – gorgeous blues and reds! Looks like a beautiful showroom. I think you hit the nail on the head with the trends you are noticing. I love framed maps with some meaning behind them. What a totally beautiful store!!!!!!! I am drooling over it..wow! I would go nuts in there…seriously! I love the idea of outdoor garden things inside, and don't think blue and white could possibly ever go "out" its just so beautiful! Timeless indeed. Classic pieces stand the test of time. What a beautiful showroom. Love, Love, Love, Blue & White!!! My passion!!! Loving that red and blue have made such a strong comeback. 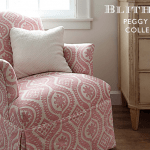 Her fabrics are gorgeous, and the showroom is not too shabby either……congrats for Marianne! What a beautiful shop! I love all her pretty pillows and wall art. Thanks for taking us on the tour. Great examples of these trends. I don't think I'll ever get tired of blue and white china. Beautiful shop. I am slowly adding blue and white back in my dining room after taking it out. 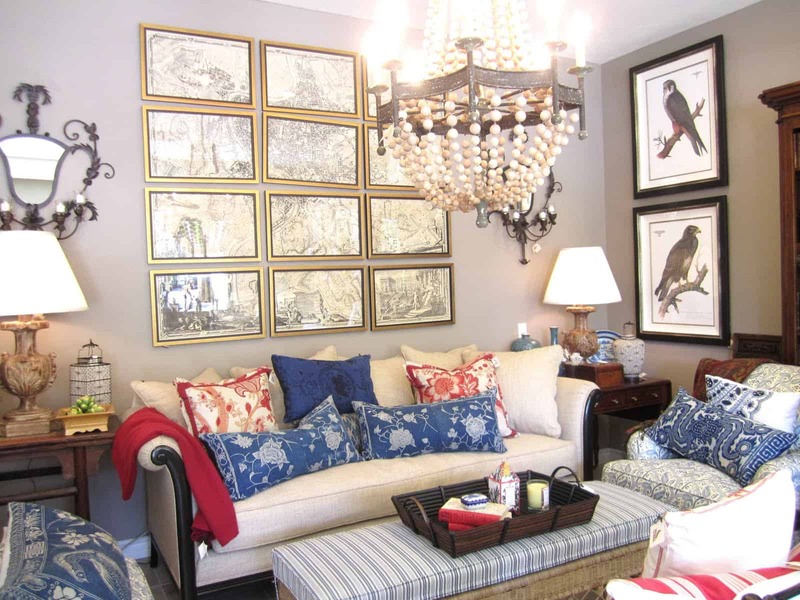 All beautiful ideas that could be incorporated into a number of styles of decorating. I'm new to your site (thank you Enchanted Home). 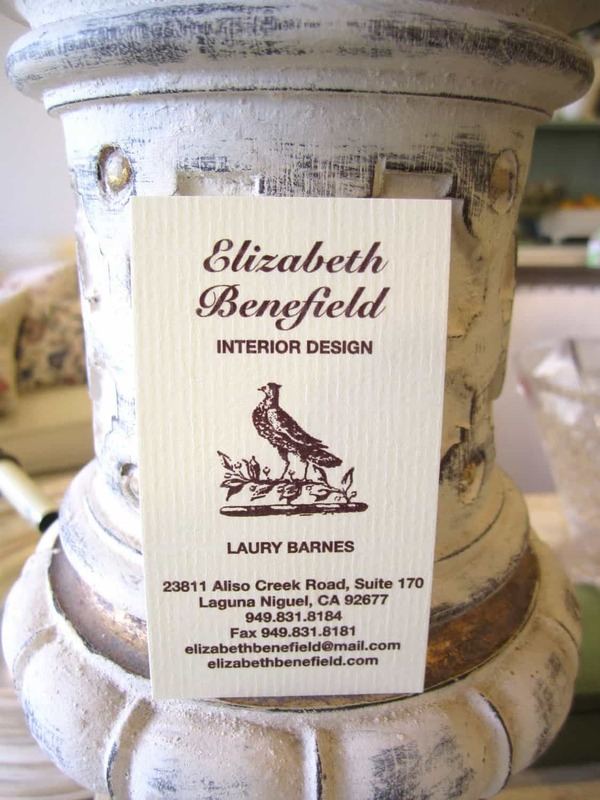 I live in Orange County and remember Elizabeth Benefield's shop on PCH (years ago). I'm thrilled to know she has opened a shop in the Design Mall south…I'll have to visit. Meanwhile, thanks for the tour. I agree, the items you mentioned add so much to any interior. I loved the pillows, maps (even as a trend) and blue and white anything. Gorgeous inspiration! Loving those blue and red pillows. Beautiful store, and lovely post on the trends you are seeing. I am liking the chinese plates too lately~! Mary Ann, these images are stunning. You were able to see a lot of beautiful things. I need more blue and white pieces! Thank you for sharing. I am going to stop by by and ake a better look. Beautiful "timeless" pieces! Love the red and blue combo, I am a little surprised it struck my fancy….Just goes to show you she has great talent and put that color combo together so well! Thanks for sharing! 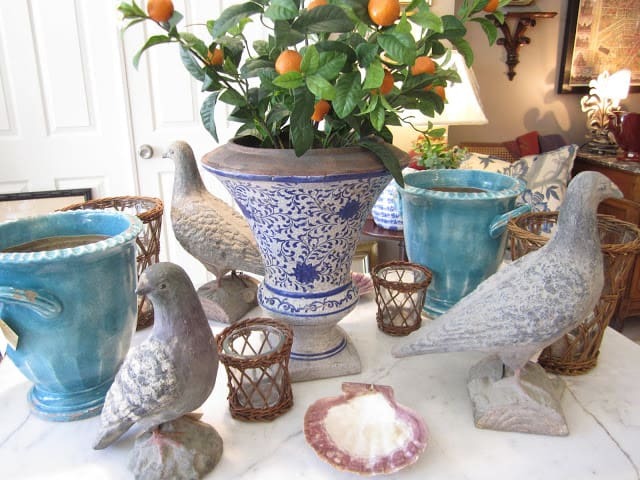 I've seen lots of blue and white ceramics. My Mom had a few growing up too that I know she still has…might need to go hunt around her home one of these days. Congrats to Marianne – I love her blog too!! Lovely showroom!! All classic beautiful trends I'd be happy to see again! 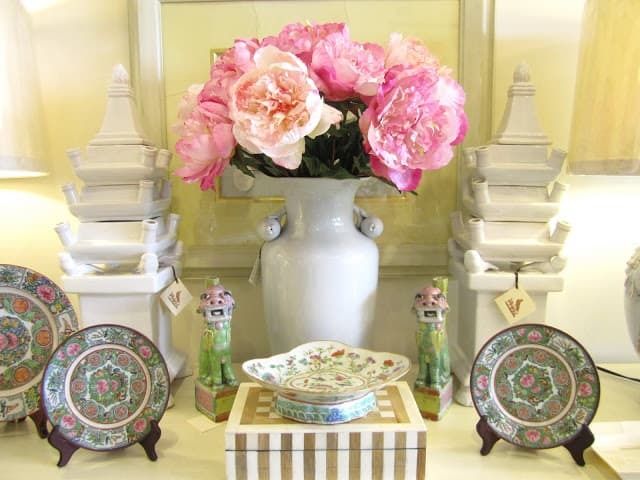 I LOVE the pink and jade plates – they're gorgeous! It's so interesting how trends change, evolve and repeat themselves in new and updated ways. Thanks for the update. It gives me ideas. Beautiful post. Can you believe I've never been to this showroom? I go by it all the time. I do love those little pink and and jade plates…I think I need to make a stop one of these day. Mary Ann, I LOVED this post! the images are beautiful! Thanks for a great start to the week! Looks like a place I need to visit. Love the maps and vintage textiles. What a beautiful showroom. I will definitely check out her blog. Hi Mary Ann, I love all the blue and white and especially the small table with the transferware platter. This looks like a beautiful shop. Thank you so much for your sweet comment on my interview at The Enchanted Home. I appreciate it. 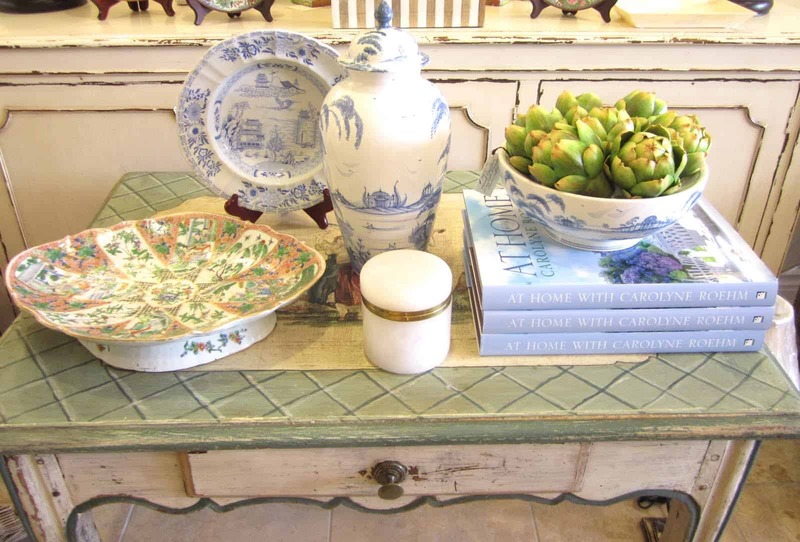 I love all of those things – especially the blue and white dishes, which are timeless. I would be in heaven…gorgeous showroom!! Love the pictures and the chandelier…fabulous!! Thanks for the beautiful tour. 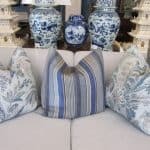 I have been loving and using the blue and white for forty plus years. I also enjoyed seeing the oriental china. I especially like the lobster bowl. Great observations and fabulous showroom! So many visual eye candy. Love her vignettes especially the final two pictures. 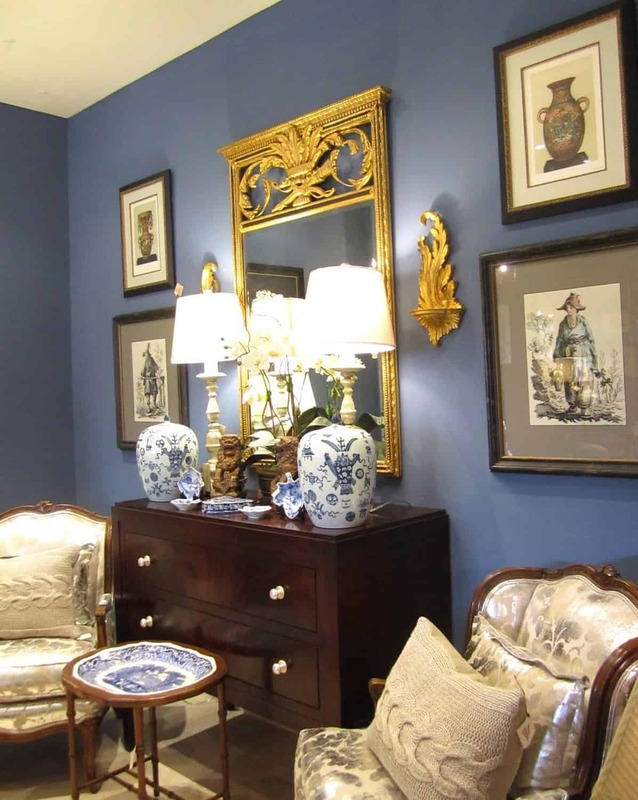 I love all the timeless decor, thanks for sharing this beautiful showroom. Great summary, there are so many beauties I'd like to take home in these pics. 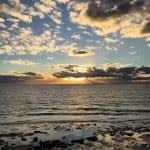 Beautiful inspirational photos. I love the timeless classic look..even though some years it doesn't seem to be 'in style'. For me, these looks are always 'in style'. 🙂 I'll check out Marianne's blog. Thanks. I like the trends, but I think they are truly timeless. I want to see a return of pretty…anything and everything pretty….I am tired of some of these depressing looks I have seen lately! Your post is definitely pretty, so I thank you for that. I really like the plates. So perfect & delicate. What a beautiful store! I love the blue and white and the maps – such classics. What a great post, Mary Ann! I'm always looking for timeless. I mean, you'll save $$$ like that and you rarely get tired of them. I hope everything is great with you, my friend. Oh Laguna Niguel, how I wish I was there again! I am such a huge fan of framed maps and love them grouped in masse (or one huge map in a group of frames.) 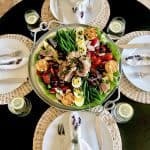 Great ideas – thanks for these tips, Mary Ann! So many beautiful ideas. Love all the blue and white jars and the framed maps. Thanks for sharing this showroom. 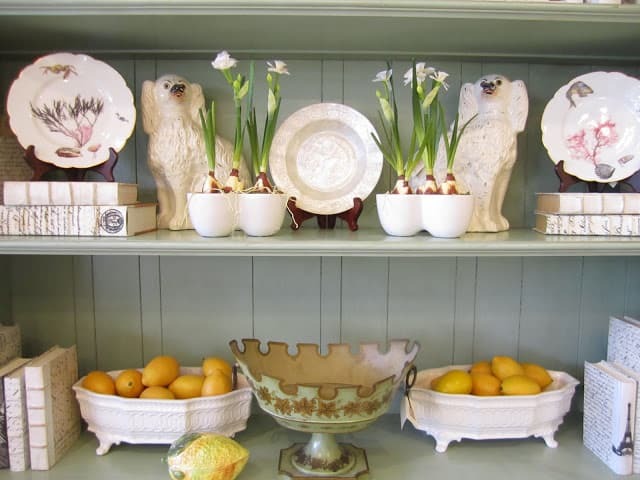 Hi Mary Ann- Gorgeous photos and ideas. I have a vintage map of London that I want to frame. I'll have to take a photo of it sometime and show you. I have just discovered your blog and I am thrilled! So much inspiration! Happy birthday Mary Ann–what a fun way to spend your birthday. We were in Newport this summer–my first time and we just loved it. The boats in the harbor are so stunning and so many great restaurants. Have a great weekend! So absolutely gorgeous, it's like I died and went to pillow heaven (c: Have a great weekend! 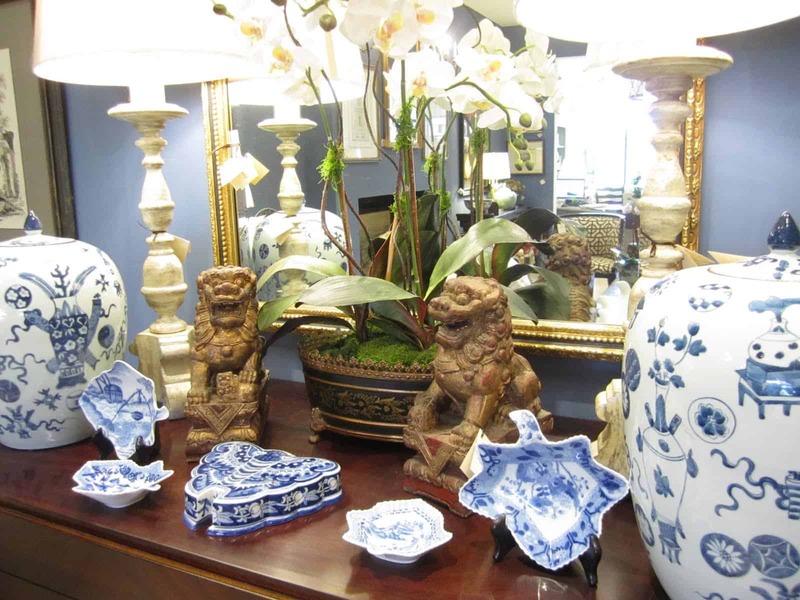 I will always love blue & white china…among many of the other elements highlighted in this store. It's all so beautiful! 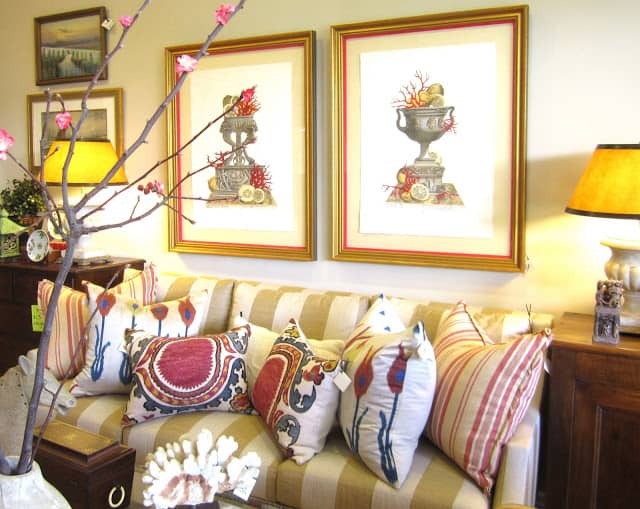 Sofas stacked with cushions looks nice in a showroom setting. But I have seen houses where so many cushions are stacked up in sofa. Then where is the comfort level? ?